It is my privilege to welcome you to the Eastchester Alumni Association website. The Board members and I are dedicated to providing alumni, former students, staff and friends with opportunities to foster school spirit, loyalty and fellowship. We welcome your participation and involvement. Our efforts are aimed at providing a platform to reminisce, revisit, and rejoice. Our spirit and resolve are distinguishing characteristics of our eagle pride. Let’s continue to strengthen the bonds we have formed, while cultivating a welcoming experience for new members. Encourage others to join in the camaraderie and revelry. Please visit our pages to keep current with events and happenings. The "card'nal and blue" will never cease to run through our veins! 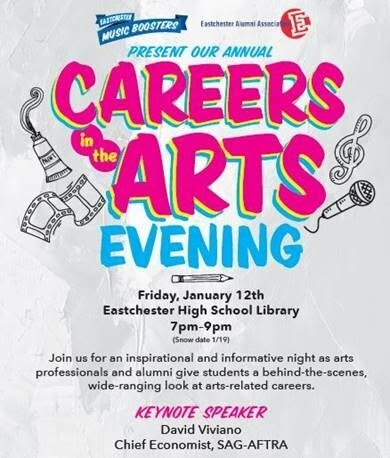 EHS Careers in the Arts! What: A fabulous one-of-a-kind event bringing EHS alumni in the Arts together to share their experiences and advice with current students.